Archaeologists studying the skull of a nun who lived in a German monastery nearly 1,000 years ago were initially baffled by the presence of vivid blue flecks embedded in her teeth. Using X-ray spectroscopy, they were finally able to identify the blue pigment as the gemstone lapis lazuli. Why would a nun living in the Middle Ages have lapis lazuli layered within the tartar of her teeth? Was she ingesting it as a lapidary medicine, or did it get on her teeth during the course of her life's work? University of York archaeologist Anita Radini told The Telegraph that the nun was likely an illustrator of lavish medieval religious manuscripts. During that time, artists ground and processed the gem lapis lazuli to make the intense blue pigment ultramarine. It's standard practice for artists to lick their brushes to get the finest tip possible to complete their detailed work. The blue pigment was distributed throughout the many layers of plaque on her teeth, suggesting she was an illustrator throughout most of her life. Highly prized and considered more valuable than gold, lapis lazuli had a singular source at the time — the remote mountains of Afghanistan. “Only scribes and painters of exceptional skill would have been entrusted with its use,” Ohio State University historian Alison Beach told The Telegraph. Researchers believe the nun was alive from 997 to 1162 A.D.
First, it was previously believed that monks alone were tasked with illustrating biblical texts. Now it is apparent that women were entrusted with this important and painstaking work. Second, the presence of lapis lazuli in Dalheim, Germany — 3,000 miles from its source in Afghanistan — reveals routes through the trading metropolises of Islamic Egypt and Byzantine Constantinople were already well established in the year 1100 A.D., according to researchers. The use of ultramarine in paintings continued well beyond the Middle Ages. It was used by some of the most important artists of the Renaissance and Baroque periods, ending in the early 19th century when chemically identical synthetics became available. Johannes Vermeer's 1665 painting, “Girl with a Pearl Earring,” is distinguished by a striking depiction of a head scarf using the pigment ultramarine. 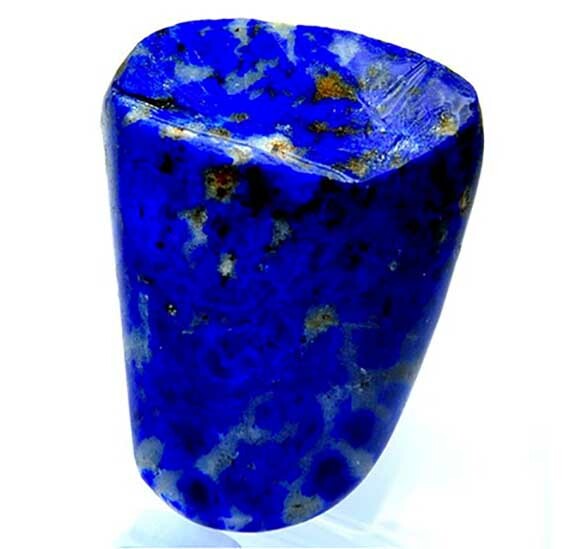 The mines of northeast Afghanistan are still the major source of lapis lazuli. Other sources include Russia, Chile, Italy, Mongolia, the U.S. and Canada. Credits: Lapis lazuli photo by Chris Oxford [CC BY-SA 4.0], from Wikimedia Commons. 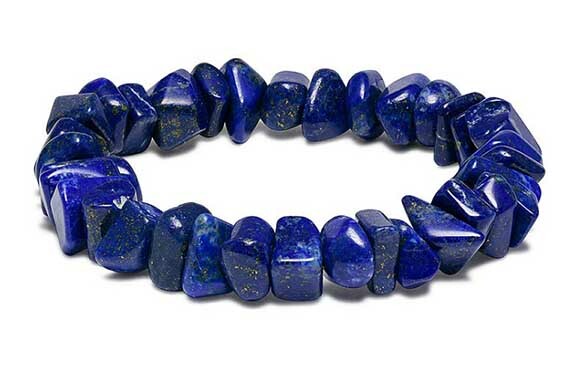 Lapis lazuli bracelet photo by Raulfj [CC BY-SA 4.0], from Wikimedia Commons. 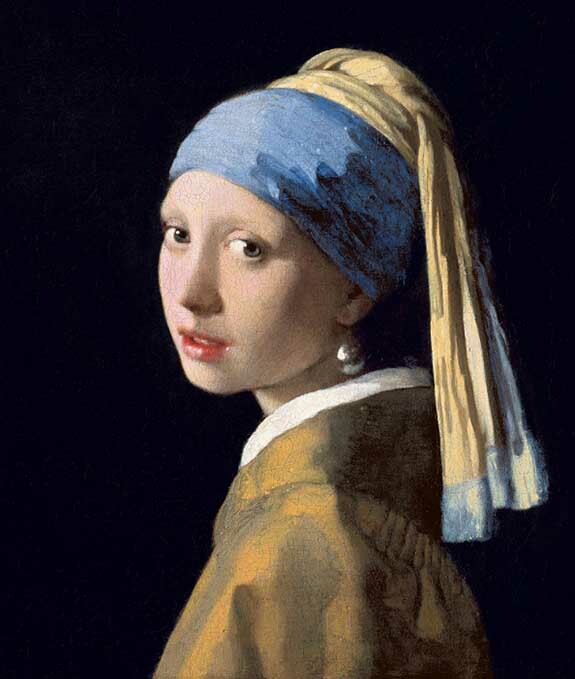 'Girl With a Pearl Earring' painting by Johannes Vermeer [Public domain].